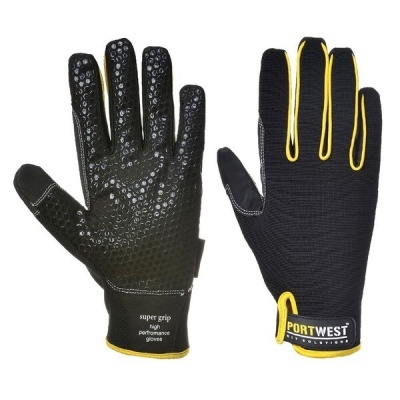 By using a silicone-covered palm, the Portwest Supergrip Leather Black Gloves A730 provide unparalleled levels of grip in dry, wet and oily conditions. While they do use a reinforced thumb for added protection, their thin, lightweight and flexible design makes them ideal for handling materials in industries that range from assembly and construction to maintenance and mechanics. The Portwest Leather Black Gloves A730 are available in three sizes that should suit the hands of most users. Please measure the circumference of your hand around the knuckles (excluding the thumb) with your hand open and your fingers together, and the length of your hand from the tip of your middle finger to your wrist.